If you’re going to be living in your RV or trailer for an extended period of time, watching TV may be one thing you couldn’t do without. Fortunately, antennas for TV make it possible for RV owners to receive basic cable. With a TV in your RV, you can watch the news, sports or even primetime programming. With other modifications, such as a digital cable subscription or satellite, you can expand the amount of possible programming you can enjoy any time. In this review, we will be taking a look at five different TV antennas for RVs for you to consider. These antennas comes from companies like King, Antop and Winegard. At the end of out review, we will choose the best antenna that is worth your time and money. Without further ado, here is our review for the best TV antenna for RVs and trailers. Has a long signal radius. Does not cost a lot of money. Can give you many different networks. Can work simultaneously with other devices. Supports up to two TVs. This first of three Winegard antennas in this review, this set includes the antenna, a 12 VDC power bank, control parts, 20 and six-foot cables, mounting hardware and a manual. The antenna is white in appearance. This antenna is meant to give your TV in your RV all the VHF/UHF channels available within a 55-mile radius. It will pick up the nearest local news stations with high quality. The antenna itself is powder-coated so that it can withstand harsh weather conditions like downpours, wind, snow and dust storms. The antenna comes with a long and a short cable, so you know you have an option and don’t need to worry about a connection that is too loose or too tight for your RV. The reception is as good as it can possibly be. We get all the local channels possible with no static, lag or glitching. This is a very responsible and competent antenna overall that gets the job done. This antenna comes with a one-year warranty for the device itself and a two-year warranty for replacement parts. Both of these warranties are rather useful and should come with no trouble should something go wrong with your antenna. This antenna looks very flimsy, believe it or not. It looks like a paper construction that is decorated right on top of the RV. It might not be as brittle as it looks, but we’re not going to say it will withstand just about anything. Antop provides us next with this UFO-like TV antenna. What you get in the box along with it is mounting hardware, an AC/DC power adapter, a power inserter, a 33-foot cable, and a manual. The antenna is shaped like a UFO, so that it can reach out in an omnidirectional 360 degrees and not be limited by a typical antenna shape. Normally, you have to tinker with the antenna to get the perfect reception, so that isn’t the case at all with this one. The antenna can grab a reception from 55 to 65 miles away, so you can be sure that you get local channels no matter if you are in the city or its outskirts. The reception is rather long, which is very fruitful, albeit the quality may not be great the further the cable sources are. This antenna comes with a built in 3G and 4G filter. Antennas like this one can typically pick up signals from nearby cell phones when they are in constant use, but this one blocks those signals out so you won’t experience any moments of subpar quality or picture on your TV. This antenna comes with a solid one-year warranty. If you notice any defects, you can turn it in within the year and get a free replacement. Also included is a 30-day money back guarantee, so if you aren’t satisfied with the product you have bought, just inquire to get it returned and you will get a full refund, no questions asked. The cable that connects the antenna to your TV is 33 feet in length, which is super long. You can be sure that there is enough length for your specific TV setups, and if you feel that it is too long of a cable, you can have a part of the cable temporarily stapled or hooked so that it doesn’t become a nuisance or hazard for the family. While it is a great satellite antenna in its own right, it is not an antenna that we recommend for the RV. We consider this antenna for its great concepts, but you will need to have a crafty and creative installer in order for installation of this antenna on your RV to be successful. This antenna was simply made for home roofing. Was not built for RVs. 47 by 28 by 16 inches. This next Winegard TV antenna for RVs is considered a vastly premium model that is capable of much more. Included with the antenna is mounting hardware, a 30-foot cable, a reflector, a mounting plate, and more. This is a satellite dish, not a basic TV antenna. Therefore, it is capable of receiving channel beyond what you can receive within a 50 or 60-mile radius. If you have a Dish TV service, receiving these channels is simple. Otherwise, you would have to stick to the free local cable. This is not technically a regular antenna. However, that can be considered even better because your selection of channels to watch can get vastly larger. Your programming can expand to networks like HBO, Nickelodeon, ESPN, and many more. You will need a satellite TV subscription, however. This antenna can allow the use of multiple devices so that everyone in the family can see what they want, and no quality has been compromised. You and your partner can watch a movie on the TV, your son can watch sports, and your daughter can see her prime time show all at the same time. This antenna for RVs also comes with a one-year warranty, so if you face problems with the satellite within the first year, you could be eligible to get a new satellite dish shipped to you. This is a very expensive TV antenna, and that isn’t even counting the satellite TV subscription that you would need to enjoy all the channels that you would add. You would think that after satellite TV has been with us for over 20 years that costs would go down, but that certainly isn’t the case. We only recommend this antenna to RV owners that can afford it without going over budget. Furthermore, installation of this antenna can be risky. It involves you having to screw the antenna into the RV, so the resale of your RV, unless you include this satellite dish, could possibly take a hit. The third of three TV antennas for the RV from Winegard comes in a mushroom shaped form. Included with this antenna is mounting hardware, a power bank, and a 30-foot cable to connect to your TV. This is another UFO-shaped antenna with an omnidirectional feature. This means you are not required to aim it in order to get the perfect reception. This antenna will receive reception from 360 degrees. This is a simple, small and sleek TV antenna for RVs. Included is a on and off switch on the power bank to toggle the antenna on and off. This antenna comes with a built-in signal amplifier to boost the signal so you can get a reception for your TV from really far away. The price is very small compared to other antennas for RVs in this review. Any sort of RV owner can undoubtedly afford it, and it will not break the bank compared to other assets you might need for expeditions. If you simply want just a new antenna that works, this is one that would fit in your criteria. Additionally, owners also receive a one-year warranty, which is great for how much this antenna costs. If it comes in with an error or defect, you are sure to be eligible for a free replacement. The range on this antenna is not that long. 35 miles is how far that the signal will go, and if there are no stations within these 35 miles, you get to enjoy classic static. Even with the built-in amplifier inside, it doesn’t really make any difference. Many RV owners simply will not like how short this range is. It’s cheap, but simply doesn’t offer much to make it appealing to consumers. Lastly, we have here this antenna for RVs from King. Along with the antenna itself, it comes with mounting hardware, a retractable dome, a 50-foot coaxial cable and a power injector. This is a satellite dish just like the Winegard SK-1000 TRAV'LER. It doesn’t cost as much, but it is still pretty pricey since its purpose to to provide satellite TV owners with all the channels that a satellite provider gives them. In this case: DirecTV. With this satellite dish, you have options for how you want this installed. This can either go on your roof or you can place it anywhere you want it to be as your RV or trailer is parked. This allows you to have the dish in potentially the safest spot possible as you watch TV. Not to worry, if you need to carry it around, as the dish only weighs just eight pounds. This antenna for RVs includes a protectable dome. In case you have your dish mounted in top of the RV, you can protect it from the elements of nature. Furthermore, this TV antenna for RVs can support up to two different TVs. If you want to watch the news, the rest of your family can watch a movie using possible an additional TV. To our surprise, this satellite dish simply doesn’t work that well. It can be quite a challenge to get a crystal clear picture, and at times, it’s similar to watching TV in 720p or even 480p, whereas at the least you would like 1080p. How to place RV TV antenna? Most RVs should have a designated place on the roof for you to install your TV antenna the easiest. You will require tools and hardware mounting supplies, but fortunately, almost all TV antennas will come with the latter for you. So long as you read the instructions in the manual carefully, you should have little to no trouble installing the antenna and getting it up and running. Of course, TVs for RVs are enjoyed most of the time in setting where there are a lot of tall trees around. This could possibly obstruct the TV antenna’s signal and keep it from giving you a crystal clear picture. Try to avoid parking your RV near tall trees, building, valleys and mountains, as you want to be sure that your installed antenna has 100 percent exposure to the sky. It is also important that your antenna is installed on the highest point of the RV and not somewhere where you can access it yourself, so that your TV gets the best picture quality possible. You are required to have either a power inverter, a portable generator, or another AC power supply so that the TV in your RV can turn on, as well as possibly have a receiver should you own a satellite and have a subscription from a satellite provider. The best TV antenna for RVs is none other than the Winegard RVW-395 Sensar DTV/HD TV Antenna. Winegard has been in the TV business since 1954, and still are doing business for good reasos. 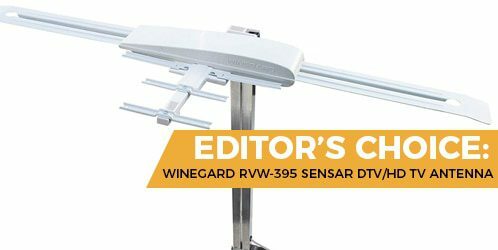 Winegard Sensar IV is the best antenna for its quality and value. It’s a simple antenna, but it comes with all the essentials to ensure that you have a stable connection and a flawless reception to get all the local channels in the area. It may look rather brittle, but don’t judge a book by its cover, as it will stay up and continue to work. Unless you snap it by driving under a low clearance, that antenna is not that easy to break. On top of that, it is very reasonably priced, and it not a hard ask at all for any kind of RV owner. These are the reasons why the Sensar IV is the best TV antenna for RVs.